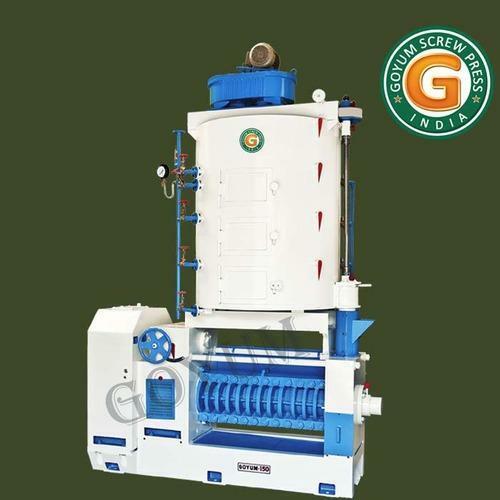 We are the leading manufacturer of Mustard Seed Oil Extraction Machine as per customer requirement. Our oil Expellers are also suitable for almost all types of oil seeds or oil nuts. Capacity: 15 - 20 ton per day (24 hours).Capacity differs with material density & quantity of oil in the seed. Goyum 150 Steel Fabricated Base & Body. Double reduction Gear Box with helical gears of Cast Steel. Cast Steel chamber of Dia.7.5"-Dia.6.5" x 45" Long of Four sections is vertically hinged. Case hardened worm assembly with hard faced discharge ring & compression ring. 4 High Steam jackets of Dia.48" for efficient cooking of seed. Pipe fitting contains safety valve, steam spray pipe, Pressure Guage, Steam Stop valves, Steam traps. We are a Star Export House recognized by Government of India. We are also Registered Suppliers of United Nation Agencies. Our D & B DUNS No. is 65-031-9911. With the decades of experience and in depth knowledge of the oil mill machinery, the company has been able to provide innovative solutions to the ever-changing needs of the customer through out the globe. The main focus of the company is to manufacture products that are cost effective and comply with international standards of quality. We create value for our customers by giving quality, technically correct, economical and on-time delivery services. We entertain inquiries from International Markets.